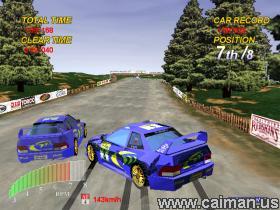 Caiman free games: Chase HQ2 Evo by HuoQi aka HQ. 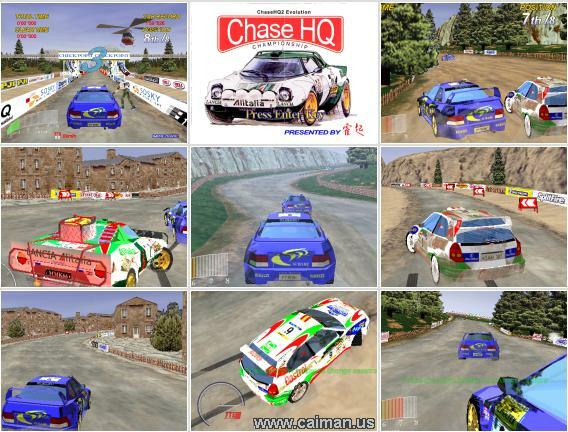 ChaseHQ2 is a fantastic 3D ralley racing simulator from China. The graphics and the sound effects are simply superb. 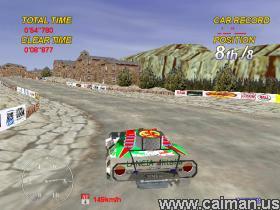 The game is in both English and Chinese. The readme files are almost all Chinese, but you don't need to read them to understand and enjoy this great game. Not only the graphics are fantastic, but the game engine must be a formidable one. The car reacts as a real car. Slipping, accelerating, etc.. it feels so real and still it is easy to control, even with the manual gears! And the most important one is the gameplay. The 7 computer opponents are really excellent! It's not very difficult to reach the 6th or 7th place, but if you want to win the rallye... brrr... you have to be an Ayrton Senna or so! Technically is this game very good too. It runs very smooth, is easy-to-play and is very challenging. You can run it in a windows as well in full screen. - Championship: Choose a car and race against 7 computer opponents in both tracks. - Practice: Choose a car and a track and test your car! Before playing the game (only for the first time): Run "Eu3E�}3?kOoAO.bat". This will generate the background music. The game when installed requires 231 MB of hard drive space. The submitter Jacket Chan wrote: "This is worth playing!". I say: No, it is not only worth playing, it's more: It's a MUST! Direct DOWNLOAD from d3.games.sina.com.cn (no install - RAR file) 32,1 MB.